Among the Paris most unmissable visits, choose the catacombs of Paris for its atmosphere and its extraordinary visit. Here is a panorama of the origins of the catacombs of Paris and a description of the visit. The origin of the catacombs dates back to the 18th century. The name “Catacombs” refers to an ossuary linked to the catacombs of Rome, a name linked to a cemetery which is not far from there. 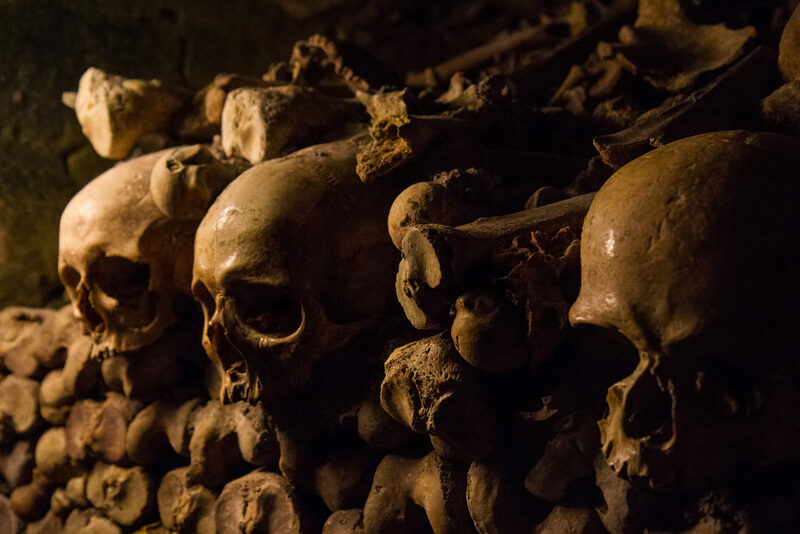 In the catacombs, you can discover the bones of more than 6 million Parisians! In the 1800s, personalities like François 1st or Napoleon went down to visit these catacombs, a visit to do. The catacombs opened to the public in the beginning of the 19th century and attracted a lot of people. It is a veritable underground labyrinth of 20 meters deep underground in old quarries. A timeless visit that can cause chills. The tour begins with the 130 steps down to the underground galleries. You can discover the the Arcueil Aqueduct, the crossing of the lower catacombs, the entrance to the ossuary and the “Samaritaine” fountain. The visit lasts 45 minutes on a one-way course of 2 kilometers. Audio guides are available in English, Spanish and German for foreign tourists for 5 euros. It is an ideal visit during Halloween day because of its slippery floor, low light, narrow spaces and its temperature (14 °). The catacombs are open from 10 am to 8.30 pm from Tuesday to Sunday and are accessible from the Place Denfert-Rochereau in the 14th neigboorhood. Guided tours in groups are possible during the week. Please note: this visit is not recommended for people with respiratory problems. Children must be accompanied by an adult.